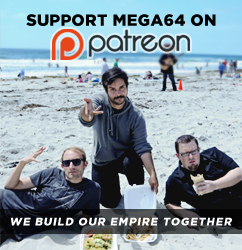 The Mega64 Podcast 322 is finally up- it took a little while because some of us have been gone and the podcast was edited and exported in a speeding car (don't ask). We're on the road- and this show is brought to you from yet another Paul McCartney concert! Will he finally play Temporary Secretary? We won't say, but we WILL tell you that we discuss Hyrule Warriors, iPhones, and burritos. Watch below. Audio version is here. Just a heads up- we still have a decent amount of Icon shirts left in our online store, but "Mega Mansion" and both hoodie designs have dwindled to a couple sizes, and those will be gone shortly. Get you order in now if you didn't already! We'll see you back here with even more stuff later this week!